When Peter Orszag left his post as White House budget director last summer, it made perfect sense, on several levels, that he ended up in an office next to Bob Rubin. Rubin, the Clinton-era Treasury secretary, had the year before resigned his position as senior counselor to Citigroup, a job for which he was paid $115 million, plus options, over nine years. Rubin’s tenure ended shortly after the bank’s near implosion and subsequent $45 billion government bailout. Rubin was temporarily bivouacked at the Council on Foreign Relations on the Upper East Side, which is something like a gentlemen’s club for the Davos crowd, one of the places, much like the West Wing of the White House, where finance and civic engagement meet and mix. Orszag was in preliminary talks with NYU about joining the faculty, but Rubin talked with Orszag about joining the Council on Foreign Relations instead. It was an influential perch from which the 42-year-old economist could write op-eds, give speeches, and travel the conference circuit. But the Council, for someone like Peter Orszag, was not a place to linger. It was a place to pass through on his way to somewhere else—and that somewhere else was Wall Street. For one of the most talented economists of his generation, the revolving door was about to spin. Shortly after leaving the White House, Orszag talked to Rubin’s close friend Roger Altman, the former deputy Treasury secretary who founded the boutique investment bank Evercore Partners, about joining his firm. But then Orszag met another one of Rubin’s friends, Lew Kaden, a top Citigroup executive, at a private dinner at the Council. Kaden, a former lawyer for Davis Polk and aide to Bobby Kennedy, had himself been brought to Citi by Rubin, even though Kaden had had no banking experience. Orszag was already deep in talks with Altman, but Kaden kept pressing, which is how Orszag found himself one morning a few weeks later in the Park Avenue office of Citigroup CEO Vikram Pandit. Pandit had a problem—one that a man with a pedigree like Orszag’s was tailor-made to solve, even if he never made the firm a dollar. Citigroup was the most high-profile of Wall Street’s basket cases, the definitionally too-big-to-fail institution. With massive exposure to the housing crash and abysmal risk management, the firm cratered, surviving as a virtual ward of the state after the government injected billions and took a 36 percent ownership position. Along with AIG and Fannie and Freddie, Citi came to be seen as a pariah institution, felled by management dysfunction and heedless greed in pursuit of profits. Complicating matters for Citi, the wounded bank found itself tangled in the populist vortex that swirled in the crash’s wake. On the left, there were calls that Citi should be outright nationalized, stripped down, and sold off for parts. Pandit was called before irate congressional-committee members to answer for Citi’s sins, an ignominious inquisition captured on live television. In January 2009, under pressure, Citi canceled an order for a new $50 million corporate jet. Bob Rubin himself pushed the bank to take on more risk in order to increase its profitability, a move that Citi’s dismal risk management was ill-equipped to handle. Pandit, whom Rubin had helped to recruit in 2007 just as the economy began to unravel, was tasked with cleaning up the mess when he became CEO in December of that year, and his early tenure had a deer-in-headlights character. Eventually, he realized that the asset class Citi lacked most was human capital, of the blue-chip variety. Orszag’s gilded résumé—Princeton, London School of Economics, Brookings Institution, Clinton White House under Nobel laureate Joseph Stiglitz, head of the Congressional Budget Office, White House budget director—would be a valuable investment in this effort. For Citi, hiring a man like Orszag, like Rubin before him, signaled that Citi would be invested in the intellectual marketplace, no mere profiteering bank but a significant American institution. Orszag’s wisdom about markets is certainly valuable; but even more valuable is his role as an impeccable ambassador for the bank, a kind of rainmaker, but at the stratospheric level. Just about anyone will take the call of a former White House budget director. “He’s a guy who can be effective in a lot of rooms,” one Democratic financier who knows Orszag told me. Before taking the job, Orszag sought the counsel of Rubin and others among his numerous mentors on Wall Street, in government, and in academe. “I did my due diligence. The view was Citi is not fully recovered, but it’s like this,” Orszag told me over lunch, tilting his hand in an upward trajectory. Certainly, the prospect of making serious money was hard to ignore. Wall Street insiders estimate that Orszag is pulling down $2 million to $3 million a year. 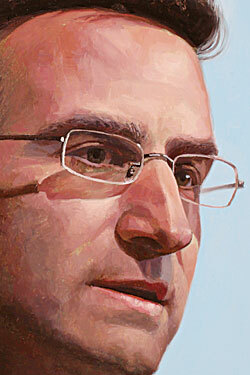 For an ambitious economist like Peter Orszag, going to work for Citigroup represented a choice. As a young staffer working in the Clinton White House, he saw laid before him two different paths: Stiglitzism and Rubinism. There were both intellectual and career-arc components to these. While both are liberal Democrats, Rubin was the consummate insider, whose philosophy was that the free markets, balanced budgets, and limited regulation would create a rising tide that would lift all boats (or at least make Wall Street not complain too much about Clinton’s social programs). Stiglitz, the public intellectual, is as concerned with the boats as with the tide. Orszag certainly had a lot in common with Stiglitz’s academic mien, having grown up in an intensely intellectual family in Lexington, Massachusetts, outside Boston. His father is a celebrated Yale math professor. But Orszag possessed an ambition that would take him beyond the ivory tower. He ultimately chose Rubinism. It makes perfect sense that Orszag would have been drawn toward Rubin. It must have been incredibly seductive seeing this world, watching the Rubin wing of the Democratic Party move so easily from government to Wall Street boardrooms to the table with Charlie Rose. The close alliance among Wall Street and the economics departments of the major universities and the West Wing of the White House is the military-industrial complex of our time. That it has an effect on our governance is beyond question. How pernicious and distorting these effects are, how cynical many of its participants might be, and what might be done to change the system are being fiercely debated in Washington. But another way of looking at this is that Wall Street has Washington over a barrel—and the values of one can’t help but be the values of the other. Even in Democratic administrations like the current one, once and future Wall Streeters are in position to pull the teeth out of regulations—for what they see as perfectly sensible, perfectly ordinary reasons. There’s no need to cue the scary music; it’s not a conspiracy. It’s just that having lived in the same worlds, read the same textbooks, imbibed the same maxims, been tutored by the same mentors, attended the same confabs in Aspen and Davos—and, of course, been paid with checks from the same bank accounts—they naturally think the same thoughts. To these people, the way things are done is, more or less, the way they have to be done. To change the system, you have to change the people; but the people are the only ones who know how the system works. Orszag expresses an easy calm despite the criticism of his recent move to Citi. At the White House, Orszag was known for his supreme self-confidence. “So far so good,” he said breezily, over a grilled-chicken salad, when I asked how he liked his new life as an investment banker. He was adjusting quite well to life in New York. He moved into a big new apartment downtown with his new wife, ABC News correspondent Bianna Golodryga, and was up at dawn with the type-A crowd for morning runs along the West Side Highway. Before our lunch, Orszag had just flown in from London, where he had been meeting with Citi’s managing directors and president and chief operating officer John Havens. Orszag took the OMB job after both Emanuel and Obama personally lobbied him to accept. (When a president asks you to serve, you do it, Orszag told me.) He was initially one of the most visible faces on Team Obama. During his first year in office, he made the rounds on Charlie Rose, Face the Nation, and The Daily Show. As the youngest member of Obama’s Cabinet, Orszag played the part of the rock-star egghead, donning cowboy boots under his navy suits and becoming something of an unlikely hunk, embodying everything that was cool about the technocratic braininess of Obama’s Washington. All this public attention gave Orszag juice: He transformed the wonky Office of Management and Budget into a power center on the West Wing’s fiercely competitive economics team. He plunged into the intense debates over the $800 billion stimulus and was also a major player in the health-care fight. Orszag was a deficit hawk and clashed with Larry Summers, who wasn’t as focused on the long-term debt crisis. Orszag argued that some of the biggest things the White House could do to tame the deficit were to tackle health care and repeal all of the Bush tax cuts. True to his Rubinesque roots, Orszag lobbied for the deficit commission; Summers was against it, telling aides that the commission posed “McChrystal risk,” because its findings could box Obama into a corner, the way the former general’s leaked report about boosting troop levels in Afghanistan did. Orszag, who had run his own team at the Congressional Budget Office, didn’t always defer to Summers, and at one meeting, the pair reportedly fought over a chair across from Obama. “Peter was somebody who could be a foil to Larry. He suffered from a small case of Summers-itis, where you display your brilliance,” one budget-policy wonk who has worked with both men explains. Orszag’s public profile, once one of his biggest assets, became a liability. In January, a “Page Six” headline blared, “White House Budget Director Ditched Pregnant Girlfriend for ABC News Gal.” The tabloid detailed how Orszag had split with his pregnant girlfriend, the Greek shipping heiress Claire Milonas, and taken up with the younger Golodryga. The baby drama was not well received by the no-drama Obama administration. Seven months later, Orszag was out. His departure did not end his problems with the White House. Not long after leaving the Obama administration, Orszag received an e-mail from David Shipley, then the New York Times’ deputy opinion editor. “We’d ­really like to get you involved, can I come see you?” he wrote. Shipley’s offer of a semi-regular economics column intrigued him. For Orszag, writing was something that came naturally. Joseph Stiglitz recalled how he had often assigned Orszag, when he was a 25-year-old member of his staff on the Council of Economic Advisers, to write weekly economics briefings for President Clinton. “Peter is one of the people who can write well,” Stiglitz told me. A few days later, Orszag and Shipley met, and Orszag agreed to sign on as a columnist. Orszag told Shipley that he wanted to write his debut column about the debate raging in Washington over whether to extend the Bush tax cuts. Congress was preparing to return from recess to vote on the issue. Obama was in full campaign mode, aggressively stumping to let the tax cuts for families earning more than $250,000 per year expire while upholding his signature campaign pledge of preserving the middle-class tax cuts. Orszag argued that Obama should accept a temporary extension of all the Bush tax cuts, then let all of them expire in 2013, including those to the middle class. Orszag’s plan made a certain amount of economic sense from a deficit-hawk perspective—keep the money pumping through the system at the depths of the recession, and then, when things got better, focus like a laser on the deficit. But Obama’s political advisers, as well as Summers, thought it politically daft, seeing as Obama had promised to make the middle-class tax cuts permanent, and also suspected that the Republicans would renege on any such deal about the tax cuts, leaving the Obamans with nothing for their concession. Orszag now says his views on taxes and the deficit were one of the factors that made him decide to leave. “I didn’t think I could be an effective advocate for the administration on making the tax cuts permanent, and I didn’t want to be in office when that happened,” he told me. The column appeared on September 7, 2010. “The debate was approaching, and I felt like I would regret not speaking out,” Orszag said. The alliance among Wall Street, ­Universities, and the White House is the military-industrial complex of our time. Orszag’s move to Citi not long after the op-ed controversy created more political baggage for the White House, as the administration sought to tamp down populist anger while repairing frayed ties to the business community by hiring former JPMorgan executive Bill Daley and swapping out Paul Volcker with GE CEO Jeff Immelt. Orszag may have been branded a sellout, but his decision to join Citi wasn’t a matter of simple favor trading. As OMB director, Orszag wasn’t involved in the White House’s banking policy. But as traders and politicians know, perception is often reality. That Orszag was hired so quickly by Citi allowed some to ask who Orszag had been working for all along. But the real dissonance was that most Americans don’t understand the career paths of the meritocracy. 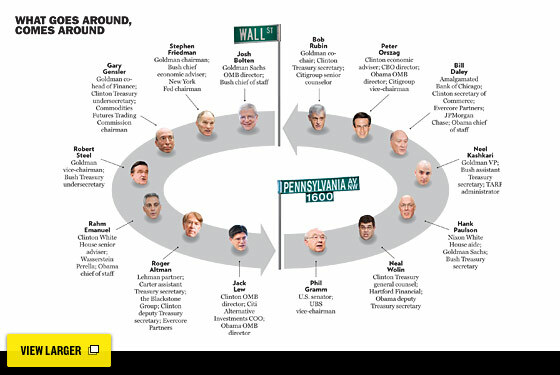 More than anyone else, it was Bob Rubin who made the Democratic revolving door work as smoothly as it has. In earlier years, Wall Streeters were probably not much less powerful in Washington, but the dominant model was that of the tycoon—Averell Harriman, say—who became a statesman. But in Rubin, the roles were somehow fused—he became a financial statesman. The role depended on a surprisingly explicit syllogism, with its own echoes of an earlier American age: What’s good for Wall Street is good for America, and vice versa. In 1971, Rubin made partner, and shortly afterward he took over the risk-arbitrage group. Junk-bond-fueled takeovers were sweeping Wall Street. Rubin was at the center of the action, wagering Goldman’s capital on the merger frenzy. Rubin was named co-chairman in 1990, running Goldman alongside Steve Friedman. They were a formidable pair, political opposites (Friedman is an active Republican, and was George W. Bush’s chief economic adviser). Rubin, a longtime Democrat and generous fund-raiser, saw his career in finance as a means to an end. “My real desire … was to get involved in politics,” he wrote in his 2003 memoir, In an Uncertain World. Specifically, Rubin wanted to be Treasury secretary. In tapping Rubin to run Treasury, Clinton was sanctioning a revolution in the Democratic Party, one that fundamentally redefined the party’s relationship with Wall Street. Rubin, along with Alan Greenspan and Larry Summers, believed in an enlightened capitalism, which would spread prosperity widely. This enchantment with the beneficence of markets became the dominant view in Democratic Washington, hard to argue with when the economy was booming, as it was in the second half of the nineties. Rubin recognized that derivatives posed a risk but effectively blocked efforts to regulate them and pushed for the repeal of the Glass-Steagall Act, the Depression-era legislation that prevented commercial banks from merging with investment and insurance firms (the new law essentially legalized the $70 billion merger in 1998 of Citicorp and Travelers Group that created Citigroup). This faith in the markets was at odds with progressive policy-makers like Stiglitz, Labor secretary Bob Reich, and chair of the Commodities Futures Trading Commission Brooksley Born, who all found themselves shunted aside. At just 60, Rubin was out of government and wanted to return to Wall Street. When Sandy Weill of Citigroup came calling, Rubin seemed to have the upper hand on Wall Street. He didn’t want to get his hands dirty managing or trading or doing deals. He wanted a platform that could afford him wide latitude, leaving time for him to pursue his passion for fly-fishing, write his memoirs, and help shape economic policy. Weill and Citi’s then–co-CEO John Reed agreed, naming Rubin to the newly created office of chairman. But Rubin soon demonstrated his immense value to Citi. In 2001, Roberto Hernández Ramírez, the CEO of Mexican banking giant Banamex, called Goldman Sachs and said he was looking to make a deal. Goldman pitched the deal to Rubin, and Citi went on to acquire Banamex for $12.5 billion. And in subsequent years, as Citi found itself facing a barrage of scandals, from the Jack Grubman favor trading to Enron, Rubin couldn’t keep his hands as clean as he’d planned. In 2002, as Enron teetered on the brink of bankruptcy, news leaked that he had placed a call to Peter Fisher, a Treasury undersecretary, and floated the idea that Fisher could advise the ratings agencies to refrain from downgrading Enron’s debt. Citi was a major Enron creditor and stood to lose hundreds of millions in bad loans to Enron if the energy giant failed. It was a particularly ham-handed use of his connections—the network usually operates more subtly than that. As the Bush White House turned Clinton-era surpluses into deficits, Rubin became increasingly alarmed that the policies he had enacted in the nineties were being abandoned. From his office at Citigroup, he retained powerful tools to shape the Democrats’ thinking on economic matters: money and an influential group of young followers who were moving into key positions in the Democratic policy-making firmament. “One of his many virtues is his ability to spot talent,” Alan Blinder says. One of those young economists was Peter Orszag. Stiglitz had been a powerful early mentor, a progressive voice who was often at odds with Rubin, Alan Greenspan, and Summers. In 1994, Stiglitz took Orszag on a trip to Russia to advise the Russians on transitioning to capitalism. Orszag demonstrated that he was comfortable playing at a high level. He had spent a year in Russia in 1992 working under the economist Jeffrey Sachs and knew many of the Kremlin officials. “He had closer connections to the Kremlin and inside, backdoor connections that were probably stronger through him in many ways than standard diplomatic channels,” Stiglitz recalls. When Orszag left the Clinton White House, he founded an economics consulting firm with his younger brother, Jonathan, a well-regarded economist. (In 2005, they sold it for a significant sum.) He remained close with Stiglitz, who served on the board of his company. Orszag and Stiglitz co-­authored numerous papers. But he was also spending more time with Rubin. In 2006, the two co-founded a think tank run by Orszag called the Hamilton Project, after Alexander Hamilton. Rubin’s friends say he was unfairly singled out for Citi’s implosion. Orszag understands what’s fueling the populist fervor. “You don’t go through a 45 percent decline in private-sector borrowing without tensions flaring,” he says. At Citi, he’s seeing the system from the inside and developing a more complex view of it, whereas the recent political debate was stripped of all nuance. Orszag told me he doesn’t see an inherent conflict between his two mentors. “I find it extraordinarily beneficial to have all kinds of conversations with people who have different worldviews,” he said. As Orszag moved into the spotlight, his mentor receded from it. In August 2010, Rubin quietly took a job at Centerview Partners, a boutique investment firm co-founded by Democratic fund-raiser Blair Effron. One cost of the vast disparity between the pay on Wall Street and everywhere else is that, all other things being equal, Wall Street gets more than its share of the good minds, and many of those it doesn’t control outright, it manages to influence—that’s the American system. Even a man as smart as Peter Orszag may find it hard to learn that lesson in his current classroom.